GALION — The Galion Community Theatre production of Disney’s musical Newsies kicks off this weekend, and the cast and crew are busy preparing and perfecting every aspect they can prior to opening at 8 p.m. Friday. The stage adaptation is based on the 1992 motion picture by the same name and is inspired by a true story. Lead character Jack Kelly, played by 2017 Galion graduate Conner Moreton, leads a group of teenage newspaper carriers in a strike against the publishers of New York City papers when prices soar and profits are cut. The supporting cast members and chorus include local young talent ranging in ages from 10 to 20 years old. Show dates are Friday, July 27 at 8 p.m., Saturday July 28 at 2 p.m. and 8 p.m., and Sunday, July 29 at 2 p.m. and 8 p.m.
Tickets are $15 and are available for purchase online by visiting the theatre website at www.galioncommunitytheatre.org. Galion Community Theatre will present the Disney Musical Newsies this weekend showcasing the talents of numerous local youth. Five showing are scheduled beginning Friday evening at 8pm, with two shows each on Saturday and Sunday at 2 and 8pm both days. 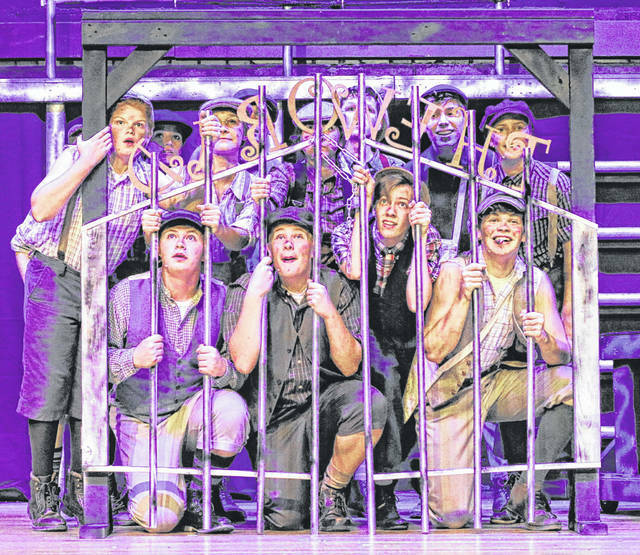 https://www.galioninquirer.com/wp-content/uploads/sites/38/2018/07/web1_Newsies.jpgGalion Community Theatre will present the Disney Musical Newsies this weekend showcasing the talents of numerous local youth. Five showing are scheduled beginning Friday evening at 8pm, with two shows each on Saturday and Sunday at 2 and 8pm both days.